The main events of the past year were not those that were noted by the man on the street, but rather those that changed people’s lives and thinking, says Vladimir Lepekhin. As usual, politicians and political analysts in the last few days of the year race to discuss its results and assess the importance of events or the number of casualties. Economists calculate profit and loss, filmmakers think in box office revenue terms, writers in the number of published books, and musicians in the number of concerts and DVDs sold. Unlike them, philosophers are concerned with the quality of events, with the anthroposophic meaning of what happened to people during this year, their mentality, their views on life and human nature. Speaking at a gala reception in the Kremlin celebrating the arrival of 2016, Vladimir Putin said that the most significant event in this past year was certainly the 70th anniversary of our people's Victory in the Great Patriotic War. This is true. Given the large number of disruptive events in Russia, some of them perceived as negative while others as positive, the most significant event was certainly the celebration of the 70th anniversary of Victory in WWII in Russia and other countries. 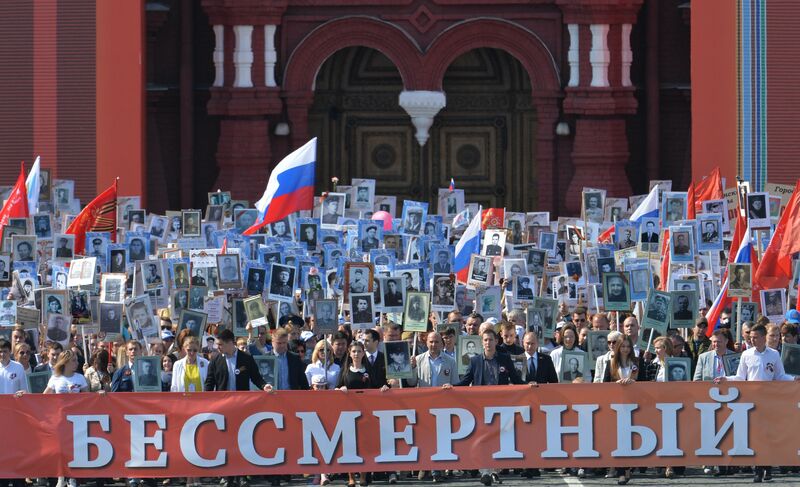 The celebrations in Russia were truly unprecedented, and I'm not referring to the traditional May 9 military parade in Red Square or the fireworks that were more spectacular than usual, but primarily the multimillion Immortal Regiment march. As President Putin said, "We marked this sacred date by paying our respects to the older generation, our fathers and grandfathers. The fate of the victors' generation inspires us to this day." So, what was the most important element of that march? It's not that this march rallied millions of people around Russia to hit the streets, although figures are important, too. The most important element is the essence of that event, which is REMEMBRANCE, the fact that Russian citizens of all nationalities, ages and political affiliations paid their respects to the generation that had brought peace and the ensuing 70 years without war to Russia and the world. It's important to note that Russians have not yielded to nationalism or any other egoistical feeling amid a new cold, hybrid or another world war, which is being imposed on the country, but instead decided to recall the country's history and to revere the memory of those who perished in defense of the Motherland. Memory of the war dead is the basis of the current social cohesion in the face of new threats. I'd like to say that the celebrations of the 70th anniversary of the Great Victory split the world into two groups. One group includes those who attended the Victory Parade in Russia and paid their respects to all other elements pertaining to it, including the memory of the fallen and the true history of WWII. The other group is comprised of those who ignored the 70th anniversary of victory over Nazism and thereby fell into the sin of FORGETFULNESS, actually refusing to recognize the lessons of the most terrible war in history. Pro-European factions may refute my allegations of European politicians' forgetfulness, saying that European countries also marked the end and commemorated the victims of WWII on May 8 by laying flowers, lighting candles and the like. Indeed, commemorating the fallen is part of remembering their sacrifices, the same as Victory Day, but is this sufficient? Selective memory, when you prefer to see history in a distorted light and the history of your country as the key part of global history, or when you remember the victims but forget about their hangmen and those who started the war, is a travesty of memory. What we see in Europe now is an example of selective memory: they have decided to "remember" WWII in a new way, without the decisive role of the Soviet Union. This forgetfulness explains the barbarous destruction of monuments to Russian soldiers in several European countries and also European support for the new Kiev government, which is threatening everything Russian, Soviet and anti-fascist. This new interpretation of the history of WWII is a result of the new status of Europe, which has transformed from being an independent subject to an object dependent on global politics. THIS IS THE KEY INTERNATIONAL EVENT OF 2015. Europe had been the main subject of global history for the past thousand years, but in 2015 the structure of united Europe split into antagonistic parts. Moreover, it is now dominated by a new anthropological type that is fundamentally different from that which developed after the birth of Jesus Christ. I describe it as Homo Oblivious. What we have here is social amnesia, which is described in psychology as retrograde amnesia. The main common European organization, the EU lost its geopolitical sovereignty due to the rejection of its historical essence long before 2015, but last year it became obvious that there are no purely independent European actors in the form of the EU, PACE or any other European organization. All of them have become mere cogs in a larger system called "the American world" or "the New World Order." The EU and the national European governments, including the super-autonomous Vatican and Monaco, now think and act only within the framework of the strategic guidelines that are approved in Washington with the assistance of London and a minor contribution from Brussels. Western Europe acted completely loyally to the US Department of State on all the main international issues last year, including interpretation of the developments in Ukraine and Syria. Despite ongoing debates in NATO, all member countries have been obediently towing Washington's line. Despite the unwillingness of the governments of Italy, Hungary, Greece and several other EU countries to extend economic sanctions against Russia, all have voted for their extension. Despite the terrorist attacks in Paris, France, where the government had previously terminated the contract to build Mistral warships for Russia, has not taken an active part in the fight against terrorism in the Middle East because it has not secured the approval of the US State Department. Germany has not managed to change its foreign policy, even if a little, for the same reason and despite a catastrophic inflow of migrants. In my opinion, the contribution of Germany and France to the Minsk Agreements is limited to the boundaries of Washington's strategy. Last year we saw the ultimate decline of Europe in the meaning that was predicted nearly a century ago by German philosopher of history Oswald Spengler, whose works were later banned by the Nazis. The loss of Western European independence is a major concern for Russia, which views European countries at the very least as its main economic partners. Russia REMEMBERS and values its relations with those western countries that were its allies in the fight against Nazism, the brown plague of the 20th century. Russia remembers and respects the lessons of history in full and with all of their nuances. Russia also knows that Europe has been split but that, nevertheless, there are many forces in Europe who take their guidance not from the United States and the unipolar world, but who have been working to create a world order that is based on plurality, which Russia has been consistently advocating. Therefore, the Russian government does not intend to lose its real and potential partners in Europe and the West as a whole. In this situation, Russia has proposed rebooting relations with the new Europe, or that part of Western Europe that honors remembrance and the related notions of tradition, real history, the Christian world, European civilization and cultural heritage. Russia is ready for rebooting its relations with Europe, including Germany, France and other countries. But who in Western Europe, which is suffering from the disease of forgetfulness, confusion and fear, will support this? When will this happen?